Addressing the U.S. Congress on Hirohito’s birthday is an insult to Pacific War veterans. Japanese Prime Minister Shinzo Abe’s April 29 address to the U.S. Congress will come at the expense of America’s Pacific War veterans. As a former POW of Japan who endured a hellish three-and-a-half years of captivity and slave labor, I am astonished that Abe’s address falls on the birthday – a national holiday in Japan – of the man who initiated World War II, Emperor Hirohito. For me, it was a day of harsher beatings and lower bows. I am outraged that this high American honor was given to a Japanese leader who still evades his country’s war responsibilities. It has been difficult for me to watch the fading memory of Japan’s war atrocities accompanied by increasing Japanese denials of their heinous war record. A complacent U.S. Congress has been complicit. In 2011, no effort was made to remember the 70th Anniversary of Japan’s surprise attack on Pearl Harbor and the American entry into WWII. This omission and others regarding the war, I understand, were the result of new House rules ending commemorative resolutions. But Congress was not totally opposed to celebratory resolutions that year. On December 19, 2011, it marked the 70th anniversary of Winston Churchill’s December 1941 speech before Congress. Churchill, barely two weeks after the bombing of Pearl Harbor, urged Americans to pursue the war first in Europe and not in Asia. As someone who fought in the Philippines in the first battles of WWII, I have painful reminders of Churchill’s successful Europe-first lobbying. Most Pacific veterans from the early months of the war believe that his efforts ensured that we were abandoned. We were condemned to hopeless battles with obsolete weapons and no provisions ending in death or imprisonment in Japan’s notorious POW camps. I think that most Americans view the bombing of Pearl Harbor as a more transformative event than a speech by a foreign dignitary – even one by Churchill. Ignoring the attack on Pearl Harbor was a slap in the face to Pacific War veterans. Previous Japanese government officials have apologized for their country’s actions before and during WWII. Abe objects to those. He believes the war was just and walked out on the parliamentary vote in 1995 for the now-standard government apology. Today, he never uses the word “apology.” Instead, he is “deeply pained” by events of the past, yet never connects them to decisions made by Japanese leaders. Speaking to Australia’s parliament last year, Abe was neither contrite nor clear. He merely mentioned “Sandakan” and sent his “condolences towards the many souls who lost their lives.” Never mentioned was that “Sandakan” was a series of death marches in 1945 on Borneo forced upon approximately 2,400 emaciated Australian and British POWs by the Japanese. I want to know what Abe learned from the past, and what steps he plans for reconciliation with Japan’s former adversaries and victims. To the American POWs of Japan, this means acknowledging our inhumane imprisonment and brutal slave labor for Japan’s corporations. It means creating a program of remembrance and education on the war. We Pacific War veterans ask most that what we fought for not be forgotten. This is what Congress must demand of Shinzo Abe. Imperial Japan was a brutal regime that was merciless to the people put in its care. It astonishes me that Japan’s leaders now avoid offering an apology or acts of contrition. Yet, if the U.S. Congress cannot remember this history, it is unlikely that the Japanese will want to disturb that amnesia. And if Congress does not speak for America’s veterans, it is unlikely that Japan will feel compelled to remember them as well. Prime Minister Abe will simply indulge this ignorance. 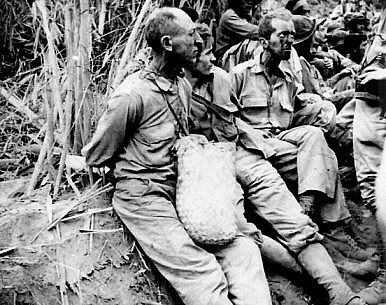 Edward Jackfert, 93, was a POW of Japan captured on Mindanao, The Philippines as a member of the U.S. Army Air Corps. He was twice National Commander of the American Defenders of Bataan and Corregidor.